"plain manners and plentiful living"
The history of furniture styles in England is so often a tale of the finest, most luxurious and design intensive furniture made for, and placed in, grand residences, mansions, and great country manor homes that the furniture most people used, in their cottages and small homes in rural areas, called English country furniture, is so often ignored. The last point, disregard for the latest developments in furniture styles, held true until at least the eighteenth century in England. Until this time period the country way of life was self-sufficient and not easily influenced by outside forces. 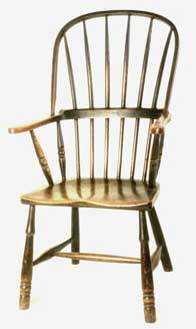 Country and cottage furniture was made according to the needs of ordinary people, which were not very demanding, and made in a simple, useful style. English country furniture craftsmen made oak settles because they provided protection against draughts in cottages and because drawers could be fitted beneath the seats for storage space. Storage needs were also served by the making of many solid wood chests, corner cupboards and hanging cupboards and these things importantly took up little space in the small cottage environment. Gradually, and with the publication of furniture pattern books such as Chippendale Furniture English country furniture making became more subject to prevailing ideas in furniture designing, particularly in the area of ornamentation. By the time of the Napoleonic Wars, in the early nineteenth century, the isolation of many villages was entirely lost. In 1825 the observer William Cobbett stopped by an old country farmhouse and noted the old furniture, mostly Windsor chairs, oak coffers, bedsteads, long tables, chests of drawers, and stools, was being put out to sale, saying "some of these things were many hundreds of years old". What was taking the place of these vintage models in this old yeoman's cottage were mahogany tables, sofas, fine glass, carpets, and fancy dining chairs. Fashion had intruded into the world of English country furniture and much of its character was lost. This decline continued for the most part until the late 19th century when a sort of revival occured in the form of the Arts and Crafts movement. It is not easy to correctly date antique English country furniture as much of it has undergone modifications over time. New fashions arose in London and then were adapated by country furniture craftsmen later on, but at uncertain times. Oak cupboards and dressers in the country were often marked with the initials of their first owners, or the date of their wedding, but are made in styles that do not match at all the dates given in the inscriptions. The appeal of the simpler world of English country furniture and decor remains to this day and reproductions make an ideal choice for cottage style decorating. Makers of reproduction English country furniture can be contacted through our country home furnishings section (Resources).